Here we are, two months in our motorhome at this lovely trailer park. I’ve been keeping busy with projects of various sorts and collecting data in regards to our water consumption habits. I feel as though this little self contained living unit gives me the opportunity to monitor resources in and out through a few devices I’ve installed. Lately, I’ve been watching our use of the grid supplied electricity with an “Energy Detective”, but I’ll save that for later. Each morning, I get up and write down the readings on the main water meter as well as the hot water meter. Over time, I can calculate average water use and notable spikes or lulls in water use. In addition, each time the fresh water tank is filled or a waste water tank is emptied, I write down the value on the meters. Average water consumption the second month is: 6.9 gallons per day. The first month was: 5.5 gallons per day. The average has risen, but is still considerably lower than the average U.S. citizen. I don’t feel that I have become lax in my conservation efforts specifically. I do not monitor Erin’s bathing and water use, so I can’t speak to that. I know that she makes an effort for sure. I can say that we have been eating at home more often, leading to more dishwashing. If that is the culprit, it’s not as though we are wasting more water, in reality we aren’t externalizing so much water use to restaurants and pre-made food from grocery stores. Above, you can see the water readings over these two months. There are a few days that I forgot to take readings, but it is complete or the most part. There is a notable spike in use on Halloween. That would be the day my cats attacked the plumbing system and wasted a ton of water. I’ll explain that next time. 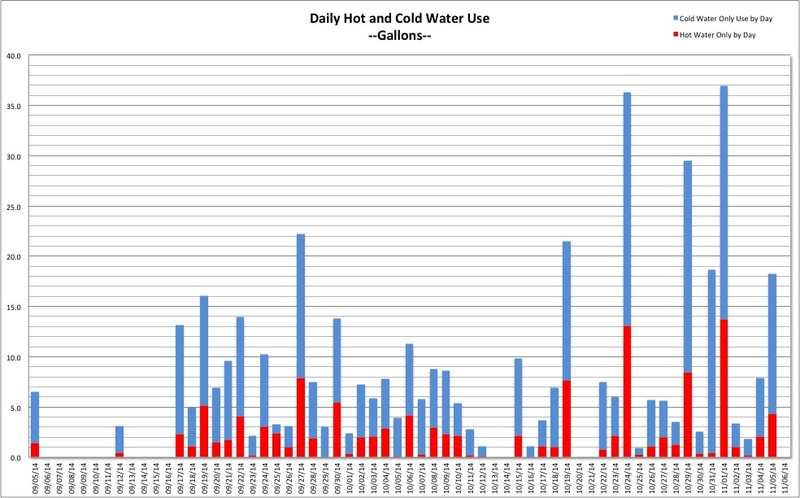 This is the daily water use, broken down to hot and cold. The height of the bar is the total consumed. The holes in the data are for a lack of readings. There aren’t really any patterns to speak of. I can say, that high hot water days are due to baths, and some of the spikes come about when home cooking/dish washing coincides with shower or bath days. We don’t shower everyday, just when we need to. Hey I just wanted to mention a great book I’ve found called Small is Beautiful: A study of economics as if people mattered by E.F. Schumacher I found an old worn copy in my father’s book collection. It’s from 1973 and it’s a wonderful book. I can’t believe there were people talking about “the problem of production” so early. What’s sad is that no one paid attention to them back then when the world population was half of what it is today. Anyways, check it out. I’m about half way through it and it makes even more sense today. As a matter of fact, I read that last year! Excellent book, yes! That’s one that holds up very well today, when so many things become dated so quickly. Our local library system is fantastic.